A little blurry, but unmistakable! I just received a news release from the RI Department of Environmental Management (DEM), asking us all to keep our eyes peeled for wild turkey broods. The public responded to the same request last year, reporting 685 sightings. Biologists are measuring what they call the “brood index” which shows how successfully the turkeys are reproducing. Apparently, 2010 was a very good year with high poult survival rates. Wild turkeys were re-introduced to RI in 1980 as part of a turkey restoration project. As HerbDoc reports in her post below, it seems to be working – at least at her house! Most birds find a well-maintained water source irresistible, and since I enjoy watching them, I do my level best to provide cover, feeders and a variety of watering/bathing stations for them. This includes two heavy metal birdbaths on pedestals where the water is changed at least every other day to rid them of the food particles, feathers and droppings left behind. Up until a few months ago, my routine worked like a charm. There was always some remaining water in both the herb and perennial garden birdbaths. I’d dump it out every other day and replace with clean water. Once a week or so, I’d add some white vinegar, and scrub and rinse them well before refilling. Then came the day when I found the herb garden bath totally empty and bone dry; this continued for weeks. I went through the usual list of suspects…the happy little gang of sparrows that seemed to arrive and leave together; the splashing robins; the cardinal who liked his 4 pmsolitary baths, etc. I even added the rambunctious raccoon and the curious baby squirrel to the mix. Finally the perpetrator was spotted! She flew to the edge of the bath, daintily dipped a toe or two and then proceeded to flail around soaking her feathers and madly preening! Our discovery was a lone hen turkey that is now tending her young somewhere in the woods. We’re hoping she’ll decide to bring her babies to the yard for a bath soon! Thanks for the reminder. I just sent an email to report the family that I saw yesterday in the yard – a hen and four chicks. I leave part of the back yard go to seed – partly out of laziness, but I like the fact that the grass seed seems to bring in the turkeys. Thanks for checking us out, Andy. I will have a peek at your blog now! That is priceless!! 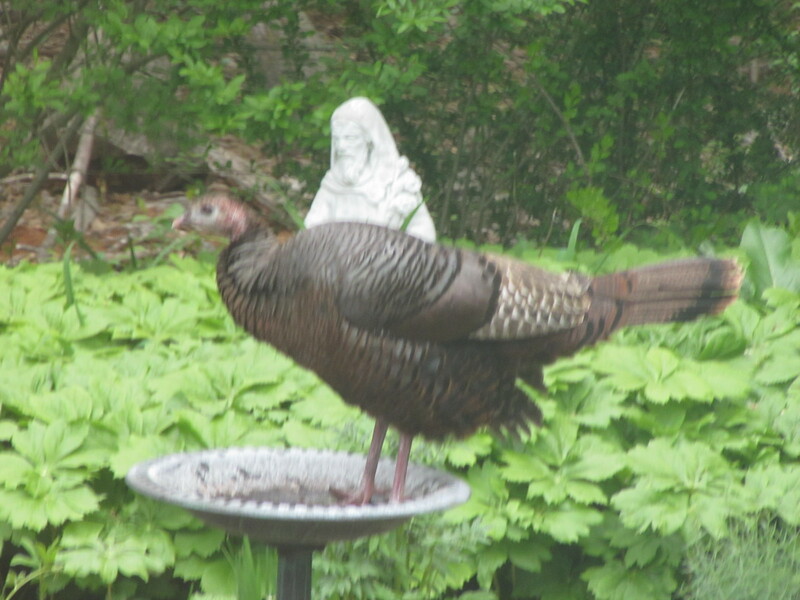 For the first time today, I saw two crows in one of my birdbaths, but a TURKEY!!! That’s hilarious. There’s nothing in the world that gives me more spontaneous joy than watching the absolute abandon of birds in the birdbath. Thanks so much for sharing this story and the pic. It’s very cool. Turkey alert! Spotted three hens with 7 babies in the yard this afternoon….very fuzzy and tiny, and certainly not big enough to get in the birdbath yet. Just too slow with the camera though. You are so lucky, HD. The hens obviously trust you enough to bring the poults to your yard. Well, we are in the woods with nothing to disurb them since I don’t have a dog. They seem particularly fond of the herb garden area, and the woods themselves are full of oak trees…thus one of their favorite foods, acorns. Interestingly the turkey population has been building steadily over the years, and they have all but wiped out their other favorite snack, ticks, which is fine with me! Yesterday, June 30, was the first time ever I’ve seen Wild Turkeys on the URI campus. At 7:15am 3 adults were crossing Flagg Road slightly east of Upper College Road.